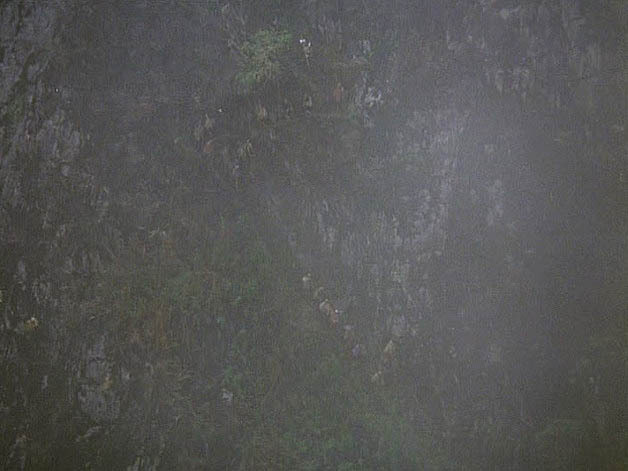 "Aguirre, the Wrath of God" begins with a shot of a huge, wooded mountain side, shrouded in the mist. We can just barely make out the figures who are slowly descending the slope, little bigger than specks on the screen. As in other Werner Herzog movies (such as his recent film "Grizzly Man" ) this opening shot suggests the utter indifference of the natural world to the exploits of man. The Spanish conquistadors who are descending the mountain, with their priests, women, and slaves are embarking on a noble quest to find the lost city of gold, "El Dorado," while simulataneously bringing the grace of God to the local savages. Lofty as their ambitions may be, the natural world, represented by the misty mountain is indifferent: the conquistadors are dwarfed by the size of the mountain and hidden by clouds of mist. This opening shot establishes a theme that develops throughout the movie. As the party succumbs to the natural ferocity of the jungle, we realize that the wilds of nature are not the domain of man. All of this culminates in a brilliant final scene, but, I suppose that's for another post. JE: Gorgeously evocative description, Nadia. You're absolutely right about how the humans are dwarfed, and made insignificant by the scale of the mountains and the mist. The people on the trails look like squiggly lines of ants. (Years later, Herzog would make another film called "Where the Green Ants Dream." Perhaps this is their dream. And the beginning of a human nightmare.) 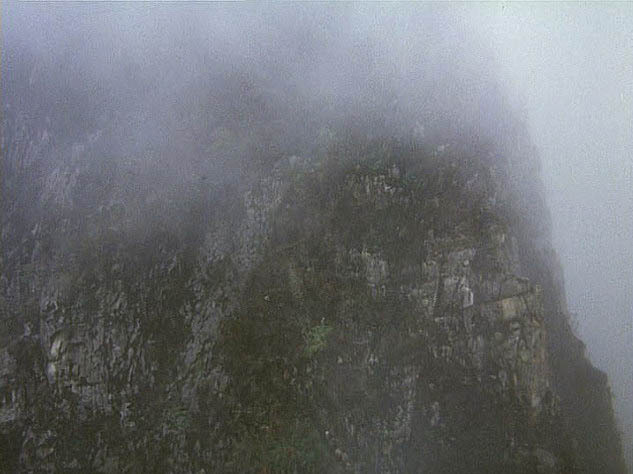 The haunting, echoing Popol Vuh music -- almost like jungle sounds, reverberating through the trees and off the mountains -- is equally unforgettable. Also, the intro speaks of beginning "our descent" -- and the camera movement (in this and several shots in succession -- is steadily, relentlessly downward. They're going beneath the clouds, into some kind of Underworld. For Aguirre, the journey of the film is a descent into madness, one that will end with him swirling in his own delusions, adrift on a raft where he declares himself the captain of a swarm of tiny monkeys. "Aguirre" was one of the first films I reviewed for my college newspaper (the University of Washington Daily) in the 1970s. I still remember the Poe-inspired headline I wrote for the review: "A descent into the maelstrom." Opening Shots: Keep 'em coming!